Traveling “The Quartet,” includes the towns of Gatlinburg, Pigeon Forge, Wears Valley, and Townsend. Does your bucket list include visiting one or more of these world famous places? Have you already made a legitimate stop over in each? And by a legitimate…not just a gas station fill up. Each are nestled in the Great Smoky Mountains and are relatively close to each other. They can all be explored in one day. If you want to make the most of the beauty, serenity and shops of the area, you will need to give your travels more time than just a day. Townsend …..to Wears Valley ….then Pigeon Forge ….and ending in Gatlinburg is basically a straight shot with little to no turns. Looking deep into the magical mountains in Gatlinburg. First, discover the start of what is now one of the largest attractions in the United States, the Great Smoky Mountains. You can do that on your first stop at the Little River Railroad and Lumber Company Museum in Townsend. If you brought along your children, reward their good behavior after the museum with tubing on the Little River. After, travel to Wears Valley for some lunch in one of the local restaurants, and visit one or two of the antique shops. You do not have to collect antiques in order to enjoy some of the memorabilia and knick knacks. There is literally something for everyone. If you need a place to rest, you can find a cabin rental in any of “The Quartet.” Search dozens of cabin rental companies via piddlin.com search. Wears Valley Road will ultimately put you onto the Parkway in Pigeon Forge. Again, a straight shot. While driving through scenic Pigeon Forge, stop and explore any of the shops or attractions that catch your eye. Consider checking out The Island. There is a ton of stuff to do there for all ages. It includes about 60 places to shop, eat and explore. You wont be able to miss the super huge Ferris Wheel! If you have been yearning to go to DollyWood, then Pigeon Forge will get you there. 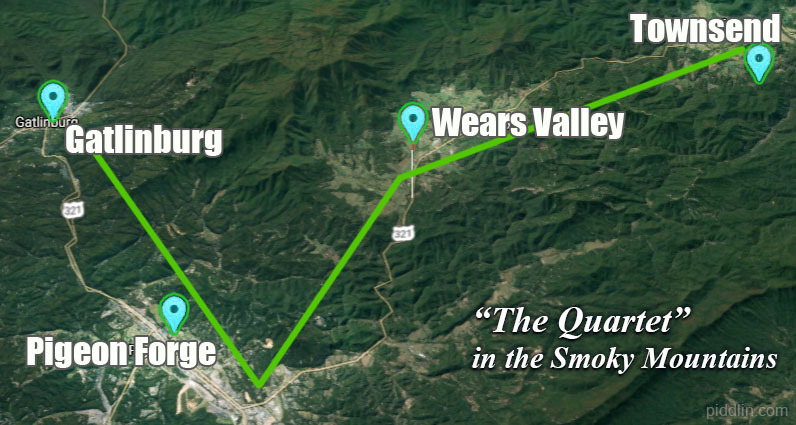 To complete “The Quartet”, head to this writers favorite part of the leg, Gatlinburg! Continue on the Parkway, and drive into downtown Gatlinburg. Ripley’s Aquarium of the Smokies would be the first choice stop, if you have never been there, and Sugarlands Distillery would be a close second. Exploring downtown Gatlinburg on foot is a treat, literally. In closing, If you have completed “The Quartet,” send us a message on Facebook and let us know. Tell us your favorite stops. We would love to post your adventure for others to explore. Cades Cove (closest to Townsend). Plan to spend multiple hours there via the scenic route and multiple cabins and wildlife to explore. Visit downtown Sevierville to see the statute of Dolly Parton, part of a 28-stop downtown walking tour of Dolly’s hometown.